Rendezvous at Tirana airport, during the transfer (85km/90min) to the hotel close to Shkoder’s center we gather first impressions and the country is introduced. After check-in and time permitting we can swim in one of the villages at the shores of the Balkans biggest lake, visit the Rozafa Castle to learn about its legend and enjoy fabulous views that excite our curiosity for the days of travel through the Albanian Alps. Back in the city the cafés bust with people that flock for a stroll to the pedestrian that is lined with bourgeoisie town houses, reminder of the cities rich past. We immerse in Italian flair of the city, the buzz of the bazaar or in Albania’s past captured on film at the Marubi photo library. Time to enjoy an espresso with the locals or meet an artisan before the daylight fades. The day comes over a carefully crafted traditional dinner to an end. After an eventful first day in Albania we are wishing each other a good night and anticipate the coming highlights of our adventure on the Peaks of the Balkans Trail. We rise early for the transfer through a scenic gorge to the Koman Dam (55km/1:30h). The picturesque reservoir loops similar to a Norwegian fjord through sheer rock walls and is considered a highlight of the Albanian Alps. The custom made ferry stops at several points to pick up locals from remote villages before arriving at Fierze (46km/3h). 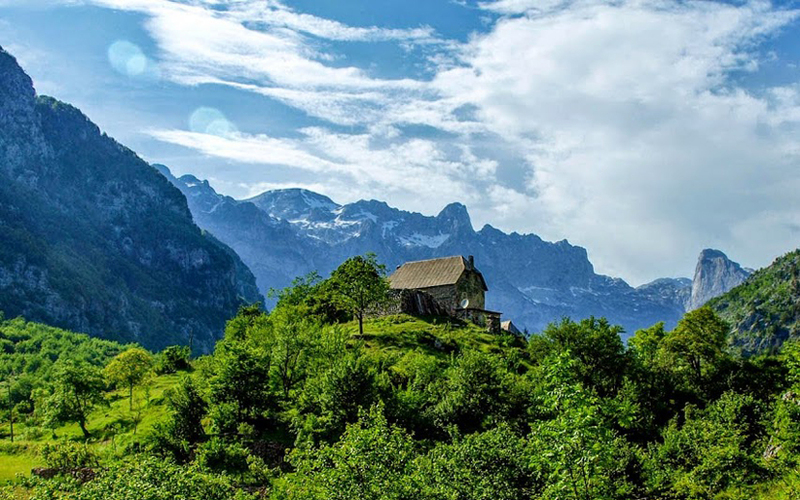 After lunch we travel by minibus past traditional villages composed of mighty, wooden shingle covered stone houses into the highlands and the Valbona National Park. 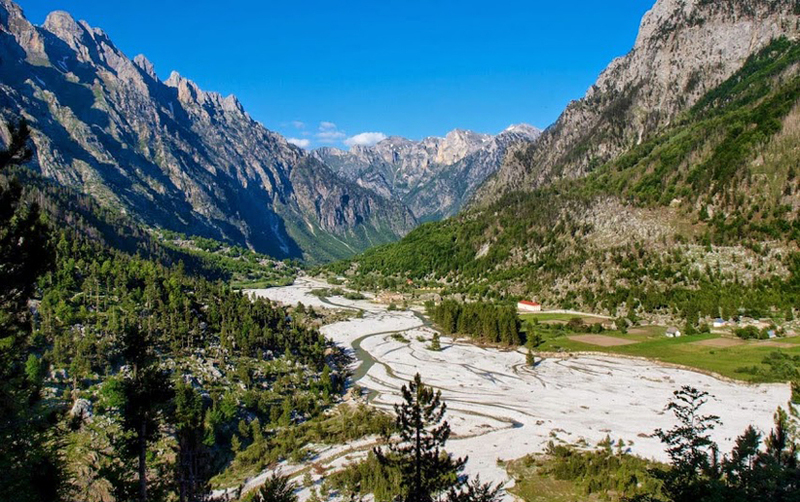 As a warm-up for the anticipated trek we walk towards the north of the valley to reach one of the most remotes hamlet of Valbona, Kukaj, where only two families live there. The walk ends at our cozy guesthouse. We itch to start the trek when we see the jagged peaks from the balcony, tomorrow will be the day. 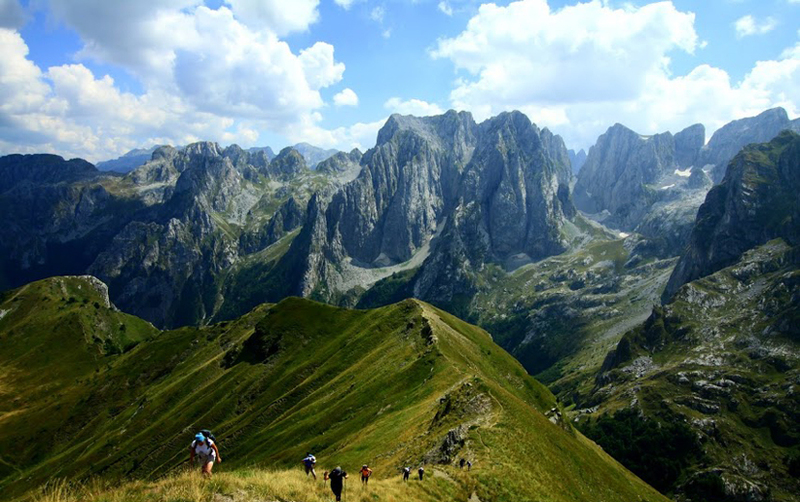 The trail starts nearby the hotel with a long ascent and views of the highest peaks of the Albanian Alps, including Jezerca (2.694m). After passing deserted pastures and a forest section a stepped alpine valley is reached. Here the solitary mountains are all ours. The Perslopit Pass (2.039m) is the highest point and forms the border with Montenegro at the base of the country’s highest mountain Kolata. Past an interesting snow cave and through a karst labyrinth we return to Albania and descend with views of the valley over meadows and meeting shepherds to the isolated village Cerem. If the weather doesn’t permit it we will walk another shorter route through a canyon to reach the simple guesthouse. Cerem is the last outpost before the Gashi NP, without mobile phone signal or electricity. Meals are prepared from the ingredient in the garden, water for washing is heated on a stove and the hospitality of our hosts makes up for the lack of comfort. For a short while we walk on a dirt road and pass through former Yugoslav territory. 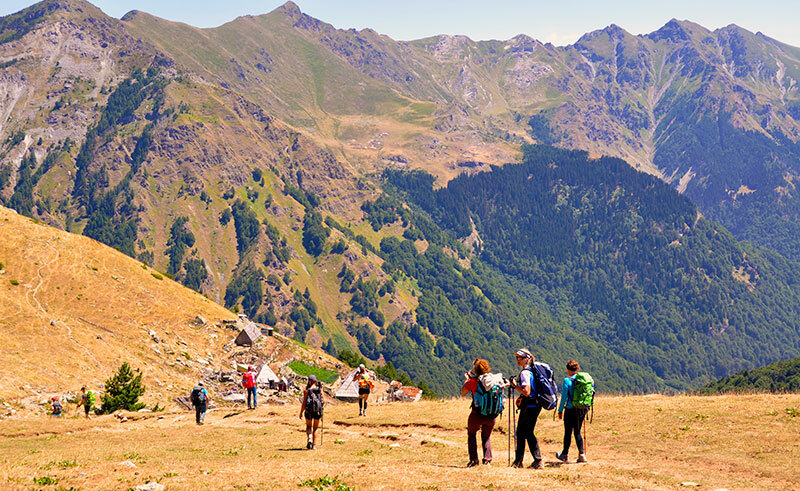 Along the way we sample wild berries, admire the plant life and views to Montenegro’s highest peak Zla Kolata (2.534m). With a bit of luck we spot the Golden Eagle (Albania’s national animal) at the rim of the deep river canyon. The slopes of the Shkelzen Massif are speckled with alpine pastures, we walk past them meeting shepherds before arriving at the glacial-shaped valley of Doberdol (1.750m). In the simple mountain hut we will relinquish the comfort of a shower in return for hospitality. A shepherd families prepares our meals and we have the opportunity to learn more about the lifestyle in the remote highlands. We ascend the border ridge and enter Kosovo and climb Tromeda / Trekufiri (2366m), the peak where the borders of Albania, Kosovo and Montenegro meet in one point. On military paths we descend to the shepherd huts of Zalli i Rupes where our minibus waits for us and we continue to Decan. The Serbian perspective on Kosovo is best experienced visiting the Orthodox Decani Monastery (13km, 25min), a monk guides us over the premises and tells us about the 13th cent church miraculously survived all conflicts unharmed and gained UNESCO World Heritage status – a truly spiritual place. Behind Peja we enter the dramatic Rugova Canyon, passing climbing routes, caves and a first Via Ferrata on our way to Reka e Allages where we have dinner with our host family. From the guesthouse our ascent follows meadows and runs on hidden trails through pine forest rich in blueberries to the base of Mt. Hajla (1.800m). The climb of the peak on a steep circular route is optional. Once the ridge that forms the border with Montenegro is reached, one enjoys great views deep into the neighboring country from the 300m high cliff. There’s a good chance to find many rare plants like Edelweiss or the endemic Albanian lily on the slopes. The descent on another route is partly trail-less and leads back to the shelter at the base. On high altitude we continue on a now unused road to the highest of the 13 villages of Rugova and finish at another guesthouse in the scenic hamlet Drelaj. 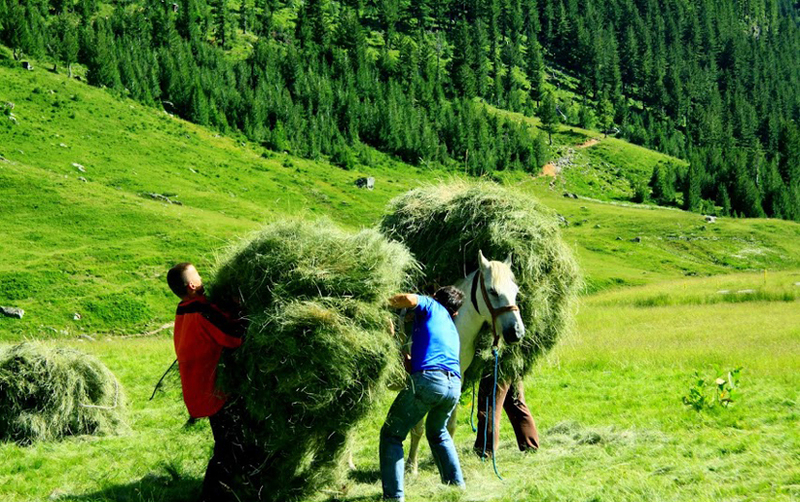 Our host wrote a book about his experience during the Kosovo conflict, the family keeps their own animals and is among the few that remain in the mountains year around. We ascend through the idyllic pine forest and rest at two emerald glacial lakes (1.850m), at their banks prospers a wide range of alpine flora. We follow the now almost invisible trail as merchants used to when this was a caravan route connected to Shkodra. At Jelenka Pass (2.272m) we reach the highest point, from here the trail is lined with blueberries in late summer, passes pads of flowers and grey rock. Below us the shepherd settlement Roshkodol is visible and around us many peaks above 2.500m. Following the ridge the terrain to Ravno Brdo Pass (2.178m) is almost level. The pass proofs to be a magnificent viewpoint of the rugged peaks and into the lush valley of Babino Polje below. While we can freely cross the border on foot the shortest road connection still remains closed. From the tiny village a car takes us to our hotel in Plav (12km, 30min). Located right at the bank of Lake Plav (900m) you can swim and enjoy the sun set on its mirror-like surface during dinner. On a minibus we drive to the village Vusanje and visit the Grlja Waterfall or a karst spring named Eye of the Skakavica. The ice-cold little river is born from the snows high up in the mountains and surfaces here as a pupil-shaped spring. The mountain framed Ropojana Valley leads to a lake where we cross back into Albania, a weathered border stone is the only reminder of the once sealed boundaries. Several shepherd huts, some shacks others abandoned military posts, line the scenic trail that take us to the heart of the Alps. The canine tooth of Mt. Arapi (2.217m) is visible from afar, reaching the Peja Pass (1.711m) your guide will decide if the summit can be tackled. The ones that decide to pass the challenging peak, suitable for the experienced only, rest at the pass. The isolated location of the mountain provides breathtaking views. A steep descent on a well-trodden caravan path followed by a short ride take us to the village Theth. On a walk through the village we visit the iconic church, famed waterfall and upon entering the lock-in tower dive into the history of the “kanun”. It is the perfect place to elaborate on the highland law code of Leke Dukagjini, its origins, impact and present day relevance. After lunch we joyfully take in the last views of the dramatic mountains on a scenic drive to Shkodra (75km, 3h). After a coffee brake we continue to the capital Tirana (100km, 1:45h). On a city walk we immerse in the turmoil of the vibrant city, admire historic buildings of all periods and explore the “blloku” district. Once the living quarters of politburo elite, it now turned into a chic upmarket neighborhood packed with boutique shops and cafes. The last day presented us a very different image of Albania that stands in stark contrast to the rural areas we explored in the Accursed Mountains. Our day concludes with a final sumptuous dinner, we recall the past week and celebrate a successful and memorable trekking journey on the Peaks of the Balkans Trail! 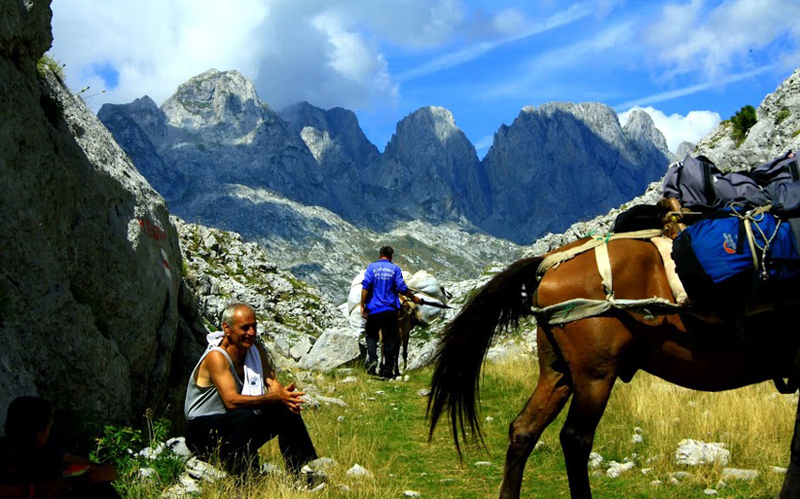 This tour includes six days of trekking on the Peaks of the Balkans Trail, a day of warm up hike and a day of relax walk in the village and cultural elements at the beginning and end of the journey. It is suitable for fit hikers who are also interested in getting to know the country, people and culture of the three traveled countries, especially those of the highlands. 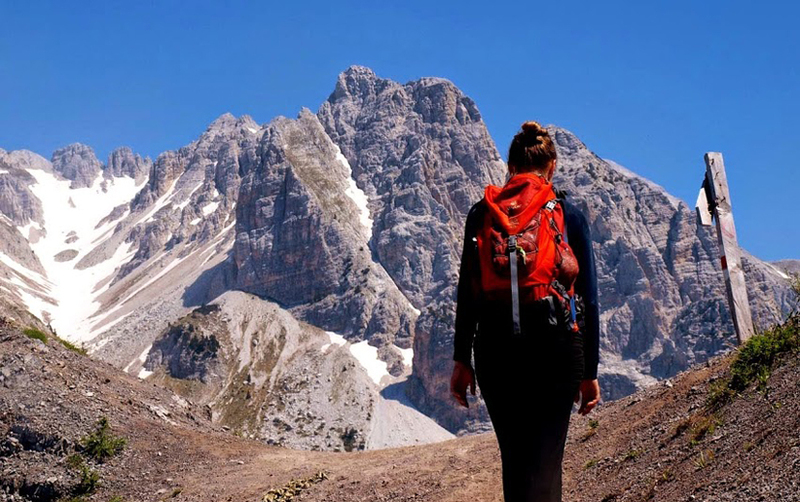 Travelers should bring previous hiking experience, be willing to forego for one overnight the comfort of a hot shower and be able to walk more than seven hours on certain days. Services included: accommodation as follows (price assuming double occupancy where possible): 1x overnight in a basic mountain hut, 5x stay in a guesthouse , 3x accommodation in hotels (private rooms), Meals usually three per day, except the ones in towns (dinner in Shkoder, lunch in Bajram Curri, dinner in Plav and dinner in Tirana). Expect to pay 7-10 euros for the excluded meals, ransfers, including the boat ride on Lake Koman, border crossing applications, English speaking guide. At your own: airfare, meals not listed above, entrance fees, including sights and museums, compulsory overseas health insurance, gratitudes, drinks and souvenirs.